I’ve been displeased by the increasingly caustic claims — led, unfortunately, by the President — that greedy millionaires and billionaires are the root cause of all that ails our economy. It’s a dangerous lie that ought to be beneath someone of President Obama’s intelligence and character, but in politics, lies are often useful for deflecting attention from failures of policy, strategy or character. The truth, and every politician and economist knows it, is that even if you confiscated 100% of all you could get from US millionaires and billionaires, you’d make only a small dent in the US budget deficit. And that for only a single year; once you’ve killed the golden goose, you get no more golden eggs. Inciting anger towards corporations and the rich is a way of diverting attention from the inconvenient truth that Washington has long been a slobbering drunk when it comes to spending. And, what’s worse, it owns the keys to the booze cabinet. All this careless rhetoric against the wealthy has elevated envy to a virtue. The Occupy Wall Street movement is rooted in envy, one of the deadliest of human sins. After all, the goal of OWS, and the deranged children it has spawned in Oakland, DC and elsewhere, is to tear down capitalism (a greed-based system) and remake society around an envy based system instead. These young idealists and anarchists imagine a society where everyone gets a piece of what everybody else has, where no one will ever be allowed to stand higher than the next guy. Capitalism succeeds because it allows someone with good ideas and a strong work ethic to rise above the average. It appeals to the competitive desire in most of us to improve, to do better. By comparison, OWS-style egalitarianism can only succeed if we all agree to pull down those high achievers and make certain that everyone is merely average. In that, the OWS movement shares an alarming amount of DNA with the French Revolution, and is attempting to live out its high-sounding creed in the streets: Liberty, Equality and Fraternity. How long will it be before they start lopping off the heads of the wealthy in Zuccotti Park? A system based on greed, or to put it more kindly, on improving one’s lot in life, in no way rules out the possibility that I can freely choose to give away some or all of my wealth to help others. In other words, if greed plays a part in my internal motivations to get ahead, my conscience might still be pricked to consider the poor, moderate my greedy ways and share what I have with others. And, in fact, many Americans do just that. A system based on envy, however, knows nothing about moderation. For the system to work, I must always be on the lookout for those who are doing better than I am, and I must always insist that they give me some of what they have. Envy becomes my reason for being; measuring myself against others becomes my full-time obsession. Blame-shifting becomes an art form in such a system. In a capitalistic system, if I don’t have enough I can usually look to myself and think of ways to improve myself by working harder, taking a second job, changing careers, etc. In an egalitarian system, if I don’t have enough, it can only mean that someone somewhere is secretly hoarding more than he needs. I become obsessed with rooting out inequality and focus all of the blame for my troubles on others, conveniently absolving myself of any responsibility. It’s attractive to blame others for my woes. There are many societies around the world built on just such egalitarian, envy-based systems. They tend to be unhappy places, where everyone feels vaguely dissatisfied with their lot, and each one is constantly suspicious that my neighbor is holding something back, or else I would surely be doing better. Is it harmful to take the excess wealth from those who are rich and spread it around? The prophet Micah in the second chapter seems to say so. He condemns Israel for seizing their neighbor’s lands, belongings and homes, and for stealing the inheritance that rightly belongs to their neighbor’s children. Yes, God has plenty to say about the corrupting powers of wealth, but he seems to be no fan of involuntary fiscal confiscation as an alternative. “You don’t have what you want because you don’t ask God for it” means that our lives will be in balance once we look to God for our needs — not government, not Wall Street, not the rich, not my neighbor, but God. The OWS movement is all about implementing envy-driven schemes that permit us to take what doesn’t belong to us, so that others foot the bill for my life needs and life choices. Our politicians have foolishly incited the mob to make a virtue of envy. The heart’s appetite for what it wants and doesn’t have knows no limits. President Obama and his supporters would be wise to stuff this violent genie back into the bottle now, while they still can. Thanks for your comment, Star. I’d be interested to know where you found your evidence that “billions starve”? I do agree that the wealthy nations of the world should help the poor, but I think exaggerating the problem is not a way of persuading anyone. The World Health Organization says that 1.5 million children die every year from malnutrition. The US provides huge amounts of free food and other aid to the world’s poorest countries, as do many other nations. How would you solve the problem of hunger? with 7 billion people in the world i dont think i am exaggerating at all when i say 1 billion are starving and or hungry. if you say that 1.5 million just children die from starvation. i guess if you dont die you dont get counted as one of the starving.millions of people around the world are starving and or hungry im sure at least a billion.and sure your america does give a little food and aid but your government never does it for free. there allways money, oil or some kind of power at stake for the people.and the way to stop starvation is to make it so everybody is able to grow and produce there own food. there should be a salary cap and everything over that should go into the world fund to go toward fixing the planet that we have wrecked and teaching people how to sustain themselves where ever they are in the world. i think there are enough scientists and smarts out there to be able to figure this out. the one that should pay the most into this fund should be the one that have done the most damage. the oil companys the coal mines the car companys and so on. i dont know but something like that. and you know its not envy thats the problem its greed.when the poor person looks at the rich person and says i wish i had their food its not envy talking its hunger talking. and when everybody around the world realizes that we are all part of just one god than mabye we will start working together to make the planet a better place . thats what i am hoping for my children anyways. We could easily solve world hunger by making God pay his taxes. Good article. Seems that “inciting envy” is really in vogue these days. I’ve always thought that one of the most important rights in our country to protect is the right of private ownership of property. 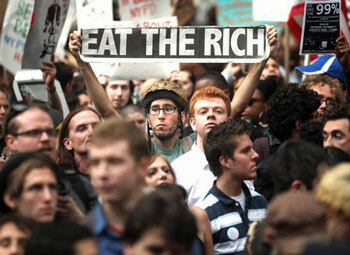 From what I’ve seen, most of the Wall Street protested are not starving and are not exactly poor, either. Speaking of world hunger, have you ever heard of Norman Borlaug? I regret to say I never had until a few years ago. He was raised on a farm in Iowa. He probably was responsible for saving over 1 billion lives when he developed high yield and disease resistant grains. By 1963, Mexico’s wheat harvest was six times larger than in 1944. His new varieties were exported to India and Pakistan and India was self-sufficient in all grains by the 1970s I think. This is something that others said would never happen. Also, his “Green Revolution” as it’s called, helped to prevent deforestation by increasing yields so people didn’t have to clear so much land for crops. He also had no patience with people who complained that third world countries shouldn’t have access to modern farming techniques and instead get by on subsidence farming. He explained that most of us here have never experienced real hunger and would be outraged if we were and someone was trying to deny us the tools we needed to grow more food. This is just one example of a person who used the gifts God gave to better their world. People are still doing things like this. My friend’s daughter just graduated with a Masters in something and is going overseas to help develop water supplies for a third-world nation. She has always been interested in that. When there’s a natural disaster somewhere, people from here rush in to help. Where I live here in Virginia, our rescue teams traveled to Haiti to help look for victims. Someone from my church was a member of the team. Also, as an aside, I keep hearing how there’s hunger in this country, yet we’re all obese and at risk for heart disease, etc. Story one says kids are hungry; story 2 says they are fat!! What does it mean?!? While you are correct in pointing out that envy is a sin, your rationalization of greed tells only half the story. There is no “kind” way to describe greed and it is more than simply wanting to “improv[e] one’s lot in life”, for it is possible to achieve such a goal without greed. The two- greed and envy- arise from the same impulse to treat things as more important than one’s fellow human beings (envy, by wanting to take chat which does not pertain to one’s self; greed, by hording goods while the basic needs of others go unmet). Furthermore, you give no reason why, if one can moderate one’s greed, why one can’t also moderate one’s envy as well. Finally, what you call “envy”, others might term “social justice”, and this may be one of those times when the truth might lie somewhere between these two poles. But I will agree that simply changing the system isn’t going to make a dent in the problem unless and until there is a similar change in people’s hearts. I would even go one step further: the latter change renders the former inconsequential, for where everyone truly loves his or her neighbor as one’s self, it wouldn’t matter whether the system is capitalist, communist, or otherwise. It means that some kids are overweight and others go hungry. The two are not mutually exclusive.